For the sauce: In a small bowl, mix together the first 11 ingredients, chiles through optional red pepper flakes; set aside. For the chicken: Pat chicken breasts dry and slice into strips, about two inches long by 1/4 inch thick. Place in a plastic food bag and add cornstarch, mixing well so chicken pieces are dredged. Heat a non-stick pan over medium-high heat and add oil. When oil is slick and shiny, add chicken strips a few at a time – do not crowd. Cook quickly, tossing as you go until they are light gold and crusted, about one to two minutes; drain on paper towel and set aside. Repeat until all the chicken is cooked. Reduce heat and add garlic and onions, stirring to prevent garlic from burning, until onions are soft and translucent, about five minutes. Add reserved sauce and chicken. Bring to a simmer and cook 30-60 seconds until thickened slightly. 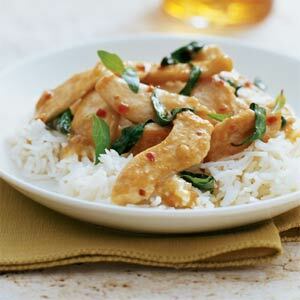 Serve immediately over steamed rice, garnished with scallion. This entry was posted in Main Courses, Recipes from Adrienne's pantry and tagged basil, chicken, chile, herbs, mint, sherry, thai. Bookmark the permalink.